Was it coincidence? Was it luck? Or was it a great combination of both? Here?s the story. In early May, U-Haul International was planning the unveiling of its new Rhode Island truck in Newport, since the subject chosen for the SuperGraphic was the Newport Tower, Rhode Island?s great mystery (see U-Haul unveiling Blog). Nicole Shropshire, public relations specialist for U-Haul?s SuperGraphics team, ran into a snag and called me. Newport?s Parks Department wanted the unveiling to take place out on Mill Street. Clearly, the best spot was in Touro Park itself, with the Newport Tower in the background. Could I convince Parks to allow this? In 1949, William S. Godfrey Jr. returned to Newport to finish the field work he?d started in 1948; he was ?Digging a Tower and Laying a Ghost,? as he called the Ph.D. dissertation he finally wrote for Harvard University (1952). 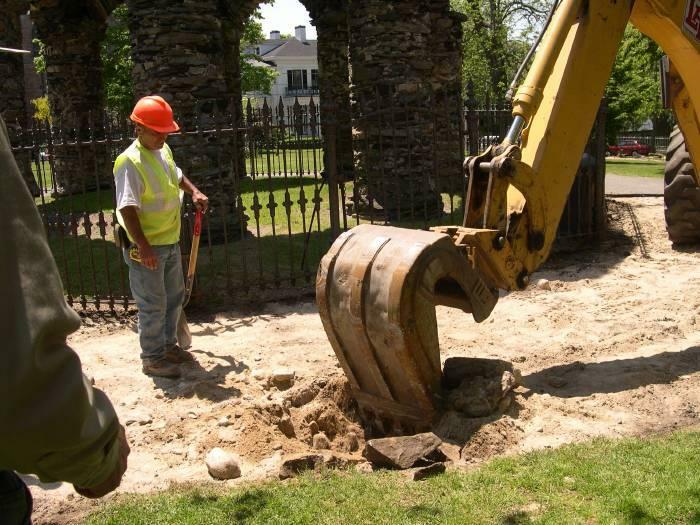 He?d begun an archaeological investigation of the Tower the year before, digging under the structure to see if he could discover anything about the Tower?s origins, long a controversy in Rhode Island. After one summer of field work, his results were ?inconclusive.? Since the City was planning to replace Touro Park?s concrete walks with asphalt the following year, the Newport City Council agreed to allow the area around the Tower, outside its iron fence, to remain open so that Godfrey could search for remnant wooden posts. Godfrey said, ?Two other operations were scheduled for the 1949 season, based on suggestions by visiting archaeologists. Brøndsted felt keenly that we should excavate to the east of the structure, where, if the Tower were Norse and there were any Norse remains, and if there had been an ambulatory, we might find traces of an altar. Secondly, many of the Norse supporters, and quite a few Colonial theorists, though for the opposite reason, felt we should clear the area under the concrete path all the way around the Tower, to make sure that there were, or were not, post holes for the corners of the ambulatory....? (p. 104). Godfrey and his team planned these two operations, but they were not to be. In 1948, renovation of Touro Park was being planned, which led to a town squabble of epic proportions and almost killed Godfrey?s project. The Parks Commission began the renovation by starting to cut down the huge old elm trees in the park. City residents rose up in wrath, and the Great Tree Controversy began. Godfrey received his permission to dig, but Louis Scott, a Park Commissioner and Alderman of Newport, ?refused to permit the path around the Tower to remain uncompleted until the excavation had been finished....? said Godfrey in his dissertation. ?When I returned to Newport in June  to begin the excavation, I found that the path had been finished, black-topped, and rolled. Moreover, it had been widened, so that even more of the area under which the ambulatory might lie was hidden than before. No logical explanation for this change in plan was given, but the attitude of Mr. Scott left little doubt in my mind that he had been behind it.? (pp. 107-108). Other problems ensued: the crew was ordered to keep its ?back dirt? inside the fence, and every now and then Godfrey and his team would arrive at the Tower to begin work and discover that the gate lock had been changed overnight. As Godfrey said, with frustration, ?...Our other two projects, the ambulatory and the trench to the east, were thus denied to us by the city...? (p.109). What if? I wondered. What if there were no coincidences in life? What if I?d happened onto a perfect opportunity? What if we could gather a crew and look at the area around the Tower after the contractor had removed the asphalt sidewalk outside the fence? What might we find that Godfrey wasn?t allowed to find 59 years ago? I called Scott Wheeler: he had no problem with the idea of a dig as long as it would be finished in time for the contractor to lay the concrete on schedule. I called Paul Robinson, State Archaeologist with the Rhode Island Historic Preservation and Heritage Commission: the Tower project was no longer within his jurisdiction. I called two members of the Newport City Council: the area around the Tower was being disturbed anyway, so they advised that we go for it if Scott Wheeler approved. I called the archaeologist who had worked with us in the Park during 2006 and 2007; he never returned my call. With an opportunity to dig where Godfrey could not in 1949, what should we do? We called Steve Voluckas, who had volunteered in both 2006 and 2007 and knew the project and its goals very well. Was there any chance he could pull together a small crew to investigate? No sooner said than done. Voluckas and Charlene Rich, owner of Miniature Occasions & Dolls on Bellevue Avenue, gathered up her co-owner Craig Roberts, plus Elizabeth Rich, Janice Donovan and son, Patrick; Judith Martinez, also a 2006-2007 volunteer, came on board; Dr. Christine Haverington, a Foundation director, and Stephen Federico joined the team, Christine serving as documentarian and photographer. The 2008 Newport Tower Extension Project began on Friday, May 30. No matter how you look at it, this was salvage archaeology with a small window of opportunity. The crew rounded up what tools and equipment they could find and established a sort of field headquarters; they improvised screens to filter out small objects such as pottery and charcoal; they dug carefully; and they measured everything?depths beneath ground surface, distance to columns, width, breadth and depth of features. They operated on the principle that, while they might not be professionals, they would provide as much information as possible, so that whatever they found could be found again at a later date and matched with other features around the Tower. They photographed everything, every step of the way, thus providing complete documentation of the project. And they did it all in four short days. That they succeeded beyond any of our wildest dreams is shown in the Photo Tour. Voluckas and his stalwart crew gradually uncovered two remnant wooden posts, each about 14 inches in diameter, each about 4.0 meters away from its respective column and in line not only with its column but also the column behind it (see schematic below). Another excavation unit was begun but had to be abandoned because rain hit hard, time ran out, and the contractor had to begin to lay concrete to stay on schedule. 1) Two remnant wooden posts were uncovered, at exactly the locations they should be if the posts were used to tie roof rafters to the capstones at the top of the associated columns. *It should be noted that the posts were no longer wooden posts as such but stains?strong discolorations?remaining after the wood had rotted away in the wet, acid soil; the same sort of discoloration has been found at other archaeological sites such as Jamestown, Virginia, where a double line of 4-inch-round discolorations indicated to the archaeologists that a stockade had been placed in a very particular orientation. 2) The probability now becomes very strong that six similar features are likely to be found (notice the hedging here?one can only hypothesize that posts will be found until excavation actually takes place), that six wooden posts at very precise locations will prove to exist around the Tower, telling us that the capstones had a specific function and that a wooden structure had been built around the outside of the Tower. 3) Since the crew found charcoal in various places throughout the units, one can also hypothesize that more charcoal will be found if an archaeological excavation is undertaken around the Tower (C-14 dating was tried on charcoal found in 2008, but the dating was inconclusive, since the layers from which it was taken couldn?t be established with certainty: the soil was loose and sandy and kept slipping around in the units). Charcoal is a great artifact for dating, since it consists of 85-98% pure carbon and represents, not the date of burning, but the date the wood was actually cut. Collection of charcoal around the Tower must be done very precisely, so that the stratigraphy can be traced and a specific date assigned to the stratum; this should yield a fairly precise date of the charcoal (±30 years) and may even lead to a fairly precise (hedging again!) date of construction of the Tower, since the two elements?stone tower and surrounding wooden building?probably would have been built at the same time. Can we say that we now know who built the Tower and when? No. All we can say at this point is that there is a strong probability that six more remnant wooden posts, and possibly associated charcoal, may be found around the Tower if and when we?re able to conduct another archaeological investigation. We can say that we?ve apparently found what William S. Godfrey wanted to look for in 1949 but was not allowed to investigate. Almost exactly 60 years after William Godfrey?s Ph.D. project was seemingly completed, we have begun what might be considered the true completion of Digging a Tower and Laying a Ghost. If there is a ghost at the Tower, it might well be Godfrey?s, flitting in and out of the arches, swooping up and down the fireplace flues, still frustrated and still wondering what it was he might have missed. Perhaps we can find out for him, so that he can rest in peace. We?d like to extend a huge vote of thanks to the crew that exposed this brand-new evidence of construction around the Newport Tower: Steve Voluckas, field director, Charlene Rich, associate field director, Elizabeth Rich, Craig Roberts, Janice Donovan, Patrick Donovan, Dr. Christine Haverington, Stephen Federico, and Judith Martinez. A special thanks goes to Manny Costa and his team, A. Sousa and L. Pinhal, Construction & Landscaping; contractors who built the concrete walks in Touro Park for the City of Newport, they also helped the salvage crew by wielding their backhoe (see photo tour) to remove huge chunks of old concrete (probably from former walks) that appeared as the top layer of sand was removed. Thanks, guys! Unless otherwise noted, all photos in Photo Tour are by Dr. Christine Haverington and are Copyright © 2008 Chronognostic Research Foundation.